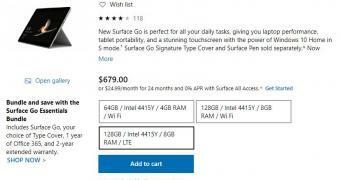 Surface Go continues to be Microsoft’s smallest and cheapest Surface on sale, but the company is making some silent changes that many customers might not like. Back in 2018 when the software giant launched the Surface Go, the lineup included just two different models, as it follows: a base configuration with 4GB RAM and 64GB eMMC storage and an upgraded version with 8GB RAM and 128GB SSD storage. A third configuration showed up at Cosco with a configuration that was placed somewhere in between the two, boasting 4GB RAM but 128GB SSD storage.